Are the mountain bike gloves necessary? Well, they definitely are. Namely, with the proper mountain bike gloves, you will be more likely to have better control of the bike. Also, they help your hands to stay in great the shape and provide comfortable grip. But, how can you find the right ones? Well, it is sole purpose of this article. We will review each pair of gloves so you can find out the right one. Before starting the glove's review, here are some tips for buying a best mountain bike gloves. Here are some of the things that you need to take into consideration in order to find the best mountain bike gloves. Your mountain bike gloves should be made out of breathable fabric. This way, your hands will be dry and kept at the optimum temperature. You can read everything you need about breathability here. As most of the gloves have leather or synthetic palm, you can be assured that your grip of the handlebar will be strong. Just look out of the leather or synthetic materials of the palm. Should they be waterproof? Well, of course, they need to be waterproof. The waterproof membranes are boosting the durability and overall quality of the glove. As we all know, all the gloves provide some level of warmth. Now, the best mountain bike gloves are optimized to provide only the needed level of warmth and protection. On the other hand, they won’t keep you hand sweaty or in a lack of protection as well. As we advance further into the subject, the time has come to talk about some of the best mountain bike gloves on the market. Let’s see exactly how you get benefitted from these gloves. Fox Racing Ranger Mountain Bike Gloves are possibly the most convenient gloves on the market. Simply speaking, they offer quite a lot since they are made out of the high-quality materials like polyamide, polyester, and polyvinyl chloride. All of these materials boost the glove’s durability and overall comfort. Not to mention, this pair of gloves features the silicone-grip fingertip which will come quite handy on a rainy day. As for the protection, the palm is equipped with the double layer which will ensure that you have the best safety. Furthermore, these gloves are featuring the absorbent micro-suede thumb which will allow you to have the strongest grip and better thumb movement. This will help you to maneuver with your hands and have better control of the bike. As for the design, we can say that these gloves are definitely sport-like looking. A simple combination of gray and black makes these gloves pretty and elegant. Now, here comes one of the best mountain bike gloves out there when it comes to the overall quality. Namely, the BOODUN Cycling Gloves are equipped with many features which will ensure you with lots of benefits. First, the shock-absorbing padding on the palm will ensure that you have the best protection when it comes to some rough ride. Also, this will help you to lower the vibration and improve the control of the handlebar. Second, these gloves are made out of Lycra material. Unlike our previous gloves, these ones are breathable and stretchable to the maximum level. This will keep your hands dry and at the optimum temperature. Furthermore, the main advantage and possibly the best thing about these gloves is the comfortable feel that they are providing. Basically, you can wear them for a long period of time without even feeling any discomfort at all. This is why they are considered as one of the best MTB gloves on the market. Also, the towel cloth on the thumb will allow you to wipe the sweat from your face on a hot day. This feature is quite something since most of the gloves are not equipped with it. Trideer UltraLight Cycling Gloves are here to provide only the best experience when it comes to mountain biking. Now, these gloves are pretty convenient for almost any type of bike activity. You will definitely find these gloves useful for road cycling, mountain bike cycling, workout, hiking, and lots of other sports activities. Now, we are only interested here in the mountain biking, and that is where these gloves mostly excel. With the shock-absorption protection and the amazing anti-slip feature, you can rely upon these gloves even in the toughest situations. Also, since these gloves are made out of the Lycra material, they are breathable and durable for anyone. Now comes the best part. These gloves are equipped with the adjustable Velcro straps which will provide you to adjust the degree and the tightness by your own likings. One thing is certain here, you can’t possibly go wrong with these gloves. NEXTOUR Bike Gloves are holding one of the top spots on the ladder of quality when it comes to mountain bikes in general. These are one fine men’s mountain bike gloves that are equipped with lots of features. Now, if you worry about the comfort or whether these gloves fit you, don’t! Since there is a Velcro Buckle equipped on the glove, you can adjust the tension by your own liking. This will provide you with the maximum comfort in any occasion. Next, these gloves are made out of the Lycra material, like the previous glove, but with a little bit of adjustment. Namely, these specially designed gloves are also made out of the excellent Knitted Mesh Fabric which will provide much-needed durability. On the top of it all, these gloves are perfect when it comes to hot days. Your hands will be dry and kept on the optimum temperature. Giro DND Gloves are possibly the best winter mountain bike gloves on the market. Namely, these gloves have some different features than the rest of the gloves that we reviewed. First, they are made out of the synthetic leather which provides outstanding durability, but it doesn’t excel that much in comfort. On the other hand, there is a 4-way stretch breathable mesh which will keep your hands dry and get rid of the moist. Second, the reinforced fingertips will ensure that your hands are protected even in the most troublesome weather conditions. Also, there is a highly absorbent microfiber that will ensure that you have the best control over the bike. All in all, these gloves are definitely made for winter type conditions and that is where they best excel in performance. Now, here comes something much different from the rest of the gloves that we have reviewed. Namely, INBIKE Cycling Gloves Men Mountain Bike Gloves are considered as the best downhill mountain bike gloves on the market. The high-quality Lycra material in a combination with knitted mesh fabric provides the best comfort for your hands. Also, the breathable materials will keep your hands dry and on a good temperature. As for the comfort, these gloves are equipped with the thick palm part which will absorb almost every shock. This way, you will be relaxed when you ride your bike and also there will be no pain felt on your hands. 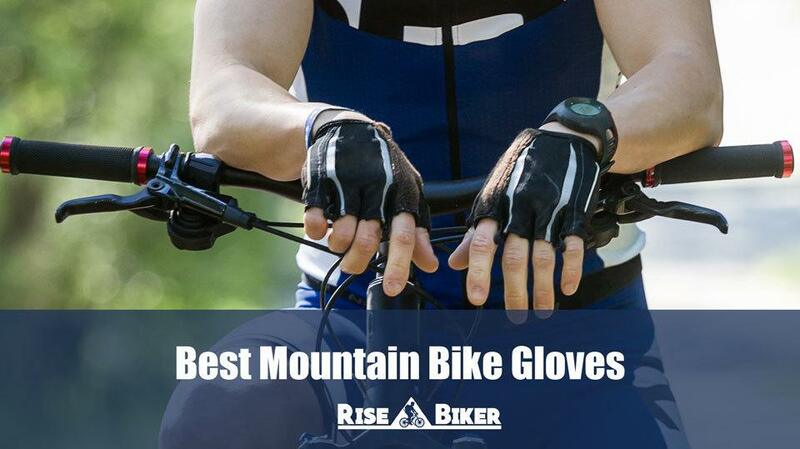 Never the less, these gloves are really something special when it comes to mountain biking. But, they don’t excel that much in the winter, other than that, they are more than fine. BOODUN Men Women Cycling Gloves are pretty good when it comes to the intense mountain biking. With the convenient towel cloth on the thumb, you can always count on these gloves to help you wipe the sweat off of your face. Anyhow, these gloves are made out of the polyester and nylon which makes them pretty durable, but not that comfortable. They are not like the other gloves that we reviewed since they are not comfortable for a long period of time. All in all, they are breathable and they provide pretty good control of the bike when it comes to some bumpy road trips. Also, these gloves are stretchable and that will come in handy for those who like to hold the handlebar tightly. In the light of everything we said above, it is only left to conclude this review with a few words about the value of these gloves. Namely, every one of these gloves is holding massive value for the cash. They all have their benefits and features, and they don’t cost a fortune. Now, it is only up to you to decide which one to get. One thing is certain here, you can’t go wrong with these gloves for sure.